I finally got to meet the man behind the changes when he was out watering his plants with a water-filled bucket one day. He said his name was Joe and the elderly man I used to see was his father; he had passed as I suspected and the house now belonged to him. It’s Joe’s love for succulents and cacti, and the spareness of desert landscaping, that accounted for the yard’s new look. Barrel cactus appeared first, followed by Madagascar palms, cycads and euphorbias. 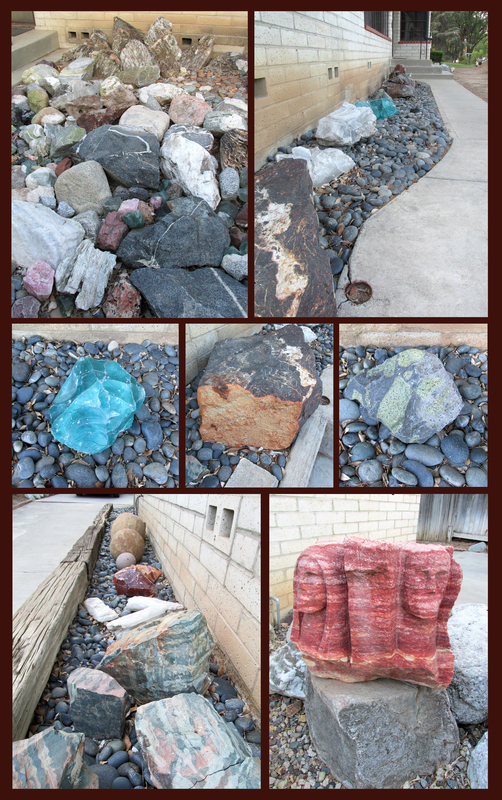 Among these striking plant materials, Joe placed massive, flat, turquoise-colored stones. I was thrilled by each new change. He was a guy after my own heart! When I first met Joe I offered him some of my agave pups; he told me he wasn’t interested and that he preferred barrel cactus. So, I was surprised at the addition of each plant that wasn’t a barrel. The day I took these photos I told Joe I’d noticed a bright lavender-colored echeveria had been added to the mix. He almost blushed as he told me he thought it was a purple agave … I smiled at this latest addition; clearly Joe was expanding his succulent palette. Speaking with Joe is dizzying: Pointing at specific plants he names local succulent providers I don’t know, and he does the same when asked about particular rocks. He offers to take me to the place he gets certain rocks and the slag glass from! … With all his sources I believe Joe will have no problem filling his front yard with all manner of juicy leafed wonders and amazing stones. Joe’s got a sly sense of humor. This toothsome welcome replaces the traditional mat at the front door. How interesting a fellow is Joe? Interesting enough to have built two slim, high-rise iguana habitats on a trailer, complete with interactive platforms. Triggered by his reptile’s weight, they provide warmth (via heating lamps), food, even music from their personal radio station. Nearby, two walled enclosures have transformed his backyard into habitats for more iguanas and a pair of California tortoises. Another humorous touch: Raising its head on a rise in the background, a brontosaurus seems to languidly stretch its neck out for a bite from a nearby shrub. Did I mention there are rocks? 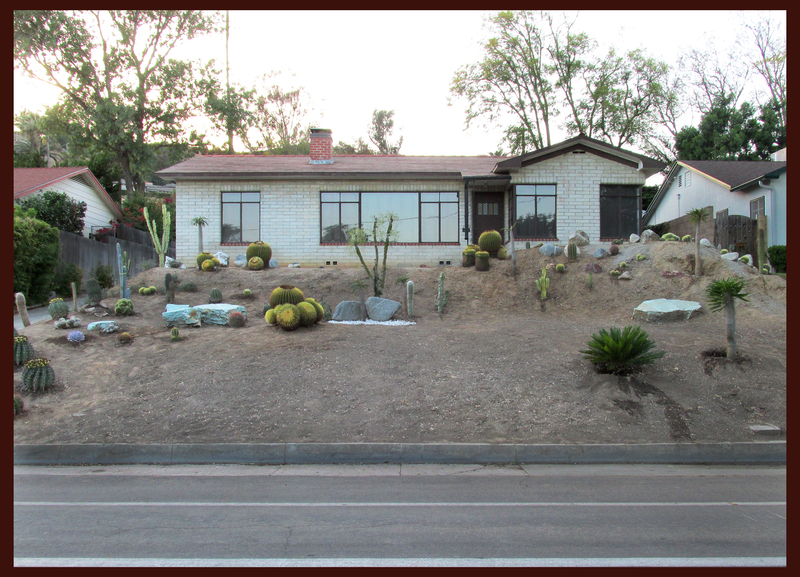 Along with the flat, plateau shaped rocks in the front yard, Joe’s strategically placed rocks to fill almost every empty space. Next to a walkway and in the back yard there are mud balls similar to those I bought from Stephen Penn for my Pipe Garden, also gorgeous chunks of colorful slag glass; a small boulder of naturally magnetized stone; rocks featuring stripes, streaks and stipples in every color; smooth river pebbles; a roughly carved mini-Mt. Rushmore in scarlet he says is crumbling. I get the sense from speaking with Joe that all of these elements — plants, stones, space — speak to him, telling him where they should be placed. I think to offer, then resist making suggestions; clearly Joe doesn’t need my help. All I need do is walk past and enjoy his latest burst of creativity. Joe is surrounded by lawnscaping, so I’m dying to know what the neighbors think of the choices he’s made in his front yard. As with Joe, I’ll have to wait until I catch them outside to ask their opinions. Fingers crossed, they’ll say they appreciate what he’s doing! Wow! 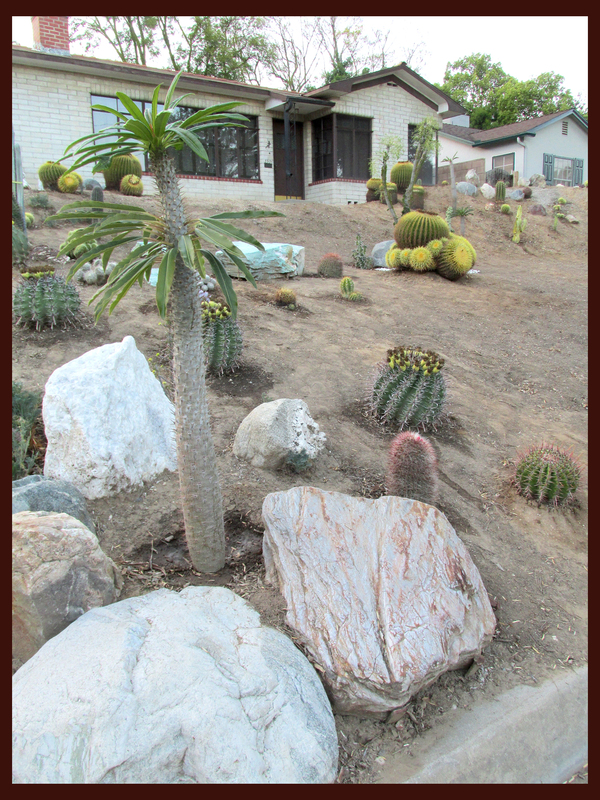 I love this yard – it is so different from the typically xeriscaped yard transformations that are happening around LA. It’s great to see such an amazing group of succulents! Thanks for commenting, Matt! It’s definitely a different animal as far as xeriscapes go … Like I said: I can’t wait to see what comes next. I have noticed this very yard in the past and admired…thanks for showcasing! It’s very hard to miss on Redwood, for sure! Thanks for commenting, Linda. wow !! I’m green with envy, this kind of garden is what I want most but will never have ! Hi, Gwen, if only more people here felt as you do … it’s what we need most but will never have! don’t they like cacti over there ? ??!!! Well you may love English lawns and roses but when you live in a hot and dry part of the world that is silly, you’ll need a lot !! of water to keep all that growing and the roses won’t last long, I think you need to work with what you have and look at the soil and your climate and then choose plants that will thrive where you live…. Bingo!, Luisa. Joe got many of his rocks from Whitewater … he’s offered my shotgun on an upcoming trip. I’m desirous of some slag glass and maybe a rock or two … can’t wait!! Hah! 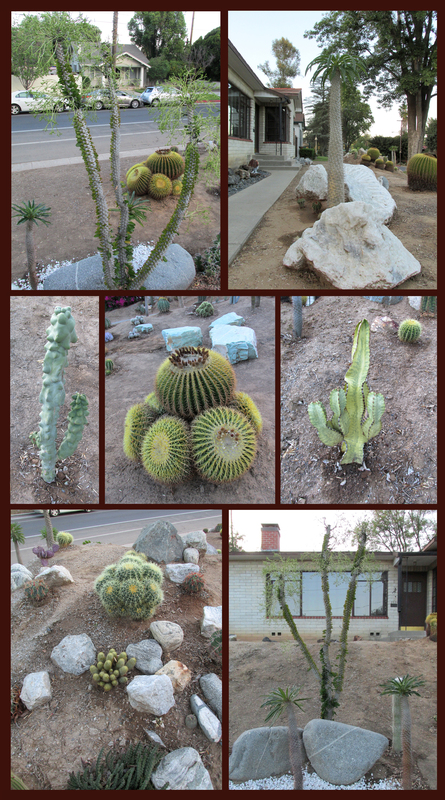 We might run into each other — I’m planning a trip out there with two friends from the Gates Cactus & Succulent group. You’re right… cannot wait!! I want more of the blue slag glass for around my property… I may have to take a trip out there before it gets too hot! I’m glad that you finally got to meet the man behind the barrel cactus, it sounds like a friendship is brewing! WOW!!! I envy you and WF. Those rocks are beautiful, I love the different colors. Sounds like an interesting guy, from your dialogue. Not sure I’m into those rocks as used, but those are some specimen colors and patterns I’ve not seen here in the land of rock! But maybe he’ll plant some more succulents in-between? Joe’s place is most definitely a work in progress … I absolutely feel that there are some major surprises coming. I’m very attracted to what he’s creating because it’s the work of someone unencumbered by what “should be”. The same impulse behind folk art is what I see at play. Thanks for commenting! Reuben-thanks so much for sharing this post. Especially the pics of all the different beautifully coloured rocks. I thought we had a pretty diverese collection of unusual and different coloured rocks, but Joe’s are amazing! Can’t wait to start acquiring new samples again. I know, Valorie, I thought I was a rock-head but Joe shamed me! Thankfully, he’s willing to share his sources. Reuben I’m glad to see that you are up and about and walking the neighborhood. I certainly hope that means that you are doing much better. It is a joy to be able to read your posts once again. I love your view on everything! I’m new enough and from far away so I don’t know all the back stories, but if this art-in-progress is typical of the views you get when you are walking through your pain, then there’s a lot of wonderfully distracting therapy to be had in your ‘hood. What fun you are in on the front end of Joe’s creative process and can help document the evolution of what looks to become a neighborhood treasure. Joe’s a lucky guy! Down the street and out of the ordinary, indeed. Don’t you love it when someone has the courage to put their vision “out there” for the world to see? While it may not be to everyone’s taste, it’s a heck of a lot better to see something unique and passionate than the same-old same-old. More power to him! Letting one’s freak flag fly takes courage, for sure! 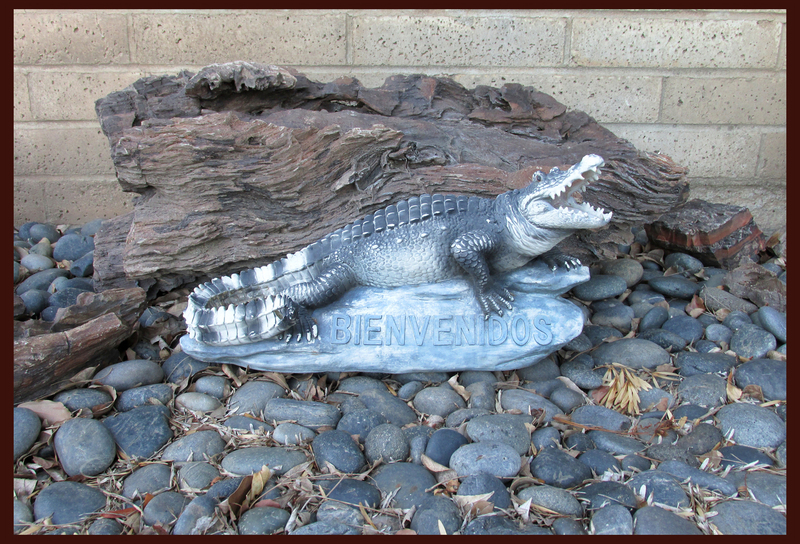 From iguana high-rises, to that toothsome welcome ‘gator, to that otherworldly front yard succulent arrangement, Joe’s my new creative hero, Pam.